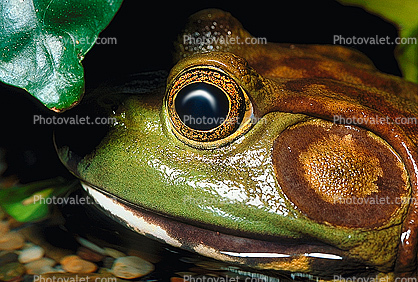 This is the frog that most in North America know as the Bullfrog. It is the largest frog in North America. Larger members of this species are known to feed on small birds, turtles and snakes. When frightened it will flee to nearby vegetation or take to the water. This species of frog is the Celebrated Jumping Frog of Calaveras County.